Automatic blade lock with push button retrieval. 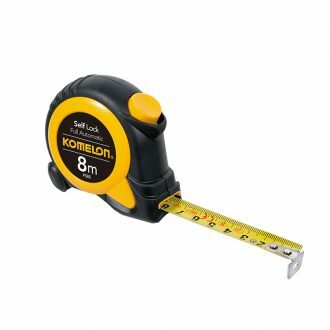 The Komelon 8m x 25mm Self-Lock Tape is a unique tape measure featuring a self-lock mechanism that allows the blade to extend smoothly and a push button release that insures complete control when retracting the blade. An ideal tape measure for the everyday DIY-er to the professional tradesman. The Komelon 8m x 25mm Self-Lock Tape is constructed with a nylon coating on the scale which significantly increases scale protection and longevity. The rubber case is ergonomically design for ease and comfort.